Anglers are missing out on some spectacular rockfishing out of the Port of Brookings Harbor. This gentleman is holding up two huge copper rockfish, part of a limit of other large rockfish species that he and two other passengers slew on Thursday. Being in a drought situation is a double-edged sword. Most of the south coast rivers are running much lower than normal. Usually the Chetco is running anywhere between 2,000 and 4,000 cfs this time of year, with anglers whackin’ and stackin’ their kings using sardine-wrapped banana plugs like K-15 Kwikfish and 4.5-inch Mag Lips. Oh, did I just use the jinxiest phrase ever? – banana plugs! That’s what we used to call them back in the day. I knew a guide who said on numerous occasions that even mentioning the word “banana” on his boat was a man-overboard-worthy offense. Just google the words “bananas on a boat” and you’ll see what I mean. You should come up with only about 13,900,000 hits. So the Chetco River is now flowing at 89.7 cfs, and according to the National Weather Service’s Advanced Hydrologic Services, it should remain in the 80-ish cfs flow at least through Tuesday, November 13. Suffice it to say, that there is not enough rain in the immediate forecast to get the salmon upriver. So where are these would-be spawners hanging out? Well, since deep water is cooler than surface water, they are congregating in the deeper pools of Morris Hole, Tide Rock and Social Security Bar, and sometimes further up the river at the Stump Hole. That’s good for folks who like using a bobber-and-egg, a bobber-and-sand shrimp or a bobber-and-shrimp cocktail combo. Some folks are even finding ways of using a bobber-and-tuna arrangement. You’ll have to encase the tuna in some netting in order to keep your offering from falling apart. Remember that until the area gets enough rain to raise the rivers, an emergency bobber fishing regulation is now in effect on the Chetco from river mile 2.2. up to Nook Creek. But, when the tide is high, sometimes the braver fish are moving back to the river mouth or even back out to sea in order to cool off their scales. So, some anglers who are trolling the Chetco bay with spinnerbait-type assemblages (with an anchovy on the end) are nailing some nice net-worthy Chinook. They are either fresh chrome-bright specimens that are making their maiden voyage through the jaws, or they are tidal fish heading downriver that are aching for some cooler scenery – specifically near-52-degree water. The fish that are first entering the system are chrome-bright beauties, like the ones that were caught on guide Jack Hanson’s boat last week by the Gunn clan from Nevada. The fish that are heading out from their tidal abodes are starting to slightly turn colors though. They could be near-chromers, or have a slight dusky tinge to their skin. Since kings tend to run the river in October and November, and do most of their spawning in December, I would still expect to see a few bright Chinook being netted in the bay this weekend and into next week, and they will still be biting until the first fall rains plummet the area. Don’t put your bottom fishing gear away just yet. Light winds and an ocean that has been flat as a sheet of liquid mercury have been beckoning salty dogs to try their luck as soon as they exit the Port of Brookings Harbor’s jaws. Surprisingly, there has not been a huge effort on the bottom-grabbers, which have mainly consisted of lingcod and rockfish – huge rockfish! On Thursday, a group of three fishermen from Medford managed to limit out on various rockfish species, all between 3 and 5 pounds, even larger! 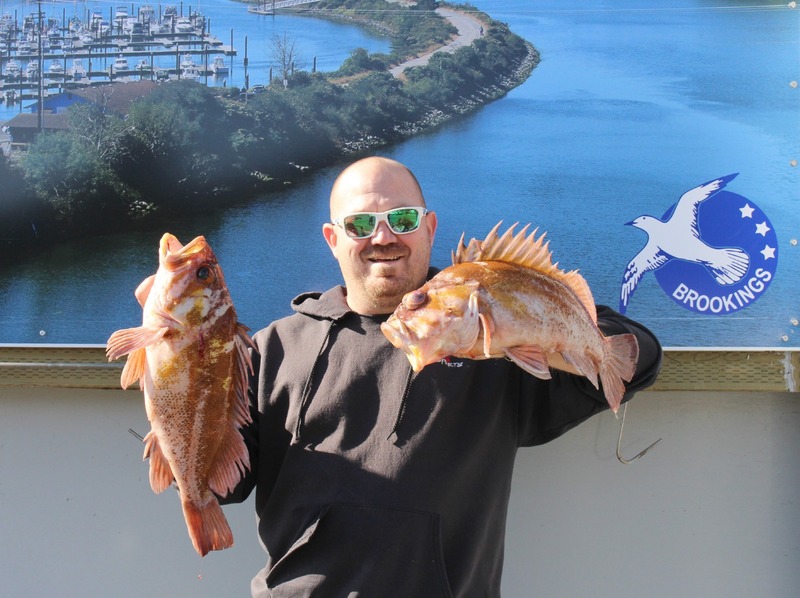 Limits consisted mainly of black rockfish and blue rockfish. But there was also a lot of color brought to the fillet tables as well, with canaries, vermilion and copper rockfish mixed in the bag. These latter three rockfish species were as colorful as they can get. They were almost too gorgeous to eat. Pass the tartar sauce, please! This is the time of year when rockfish colors will be more prominent than other months, mainly because they are performing their mating ritual. The more-successful anglers have been whacking their rockfish by using soft-plastic lures. Limits or near-limits of lingcod were also brought to the tables as well. Once again, soft plastics are the go-to baits, but some anglers like using whole anchovies or herring to unhinge the rusty jaws of the lingosaurs. This time of year, fishermen don’t have to travel too far to get their bottom-grabbers. Right out in front of the Chetco jaws contains some splendid reefs, with a lot of anglers heading downhill off of Akin Point to get their rockies. 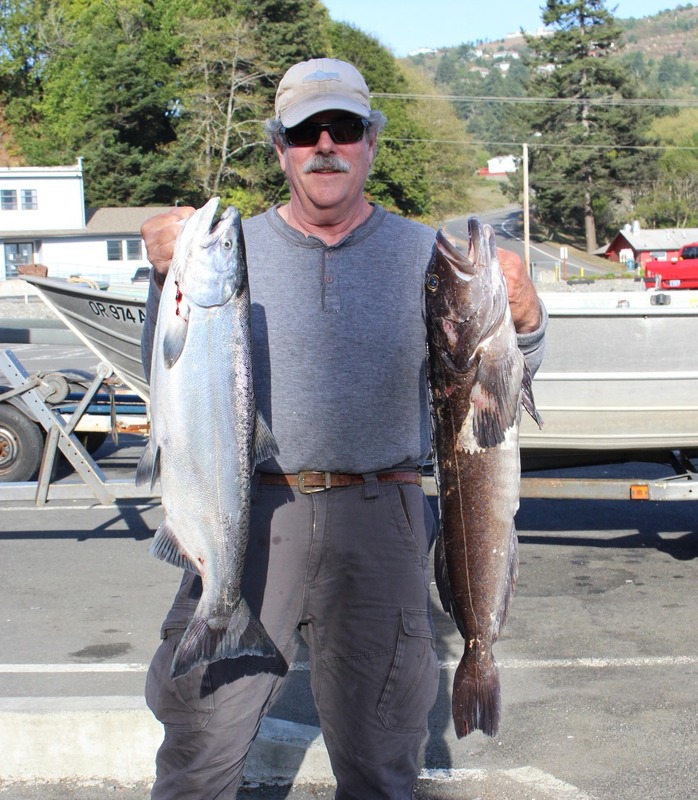 Salmon fishing in the Rogue bay has been slow to non-existent. 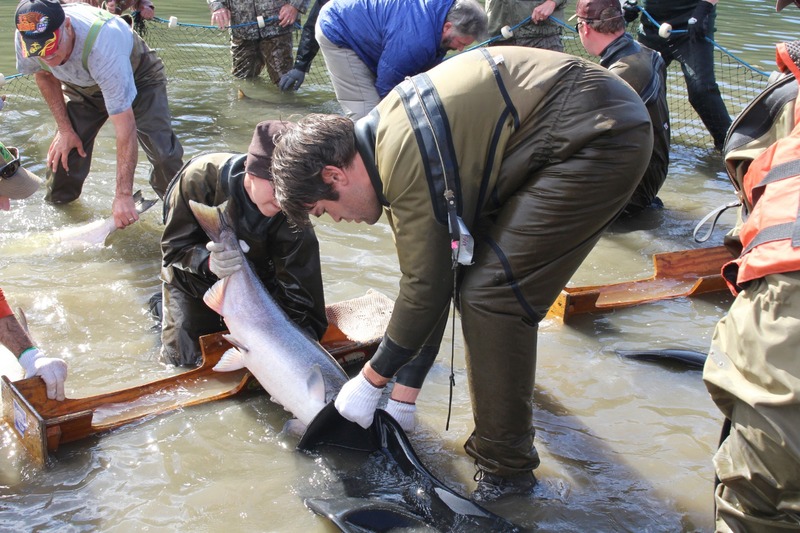 But anglers are still waiting for the Indian Creek Chinook to enter the spotlight. Indian Creek is a Rogue River tributary that spills into the Rogue about one-half mile upriver from the Highway 101 bridge, directly across from Lex’s Landing. One hopeful ODFW official told me that the Indian Creek fish are still late. And that makes sense because Indian Creek is narrower than a trickle at the present time. As soon as there is enough rain to raise Indian Creek, I am of the opinion that the Indian Creek Chinook are going to hit the bay in one fell swoop, and will be up the creek even faster. So don’t put your Rogue trolling gear in mothballs just yet – they’re coming! 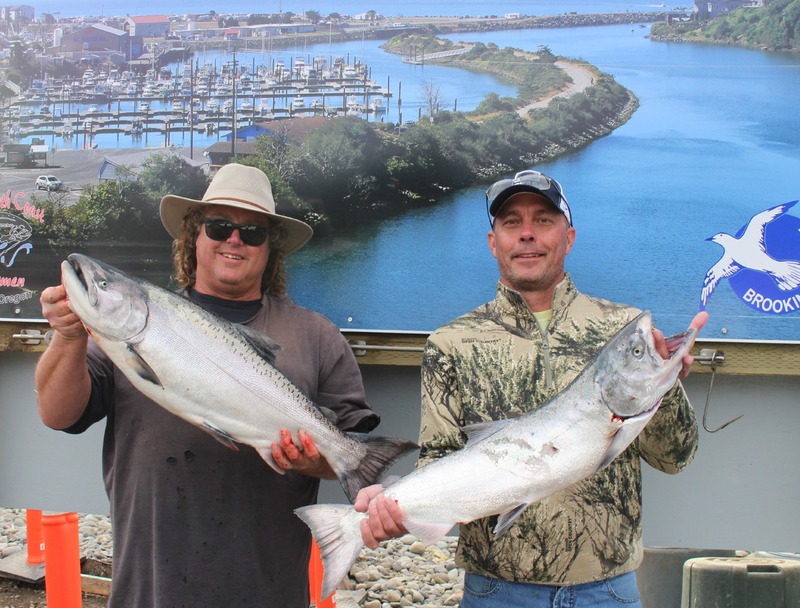 Scott Gunn and Craig Chisum from Nevada nailed these two chrome-bright kings last week while trolling the Chetco bay with guide Jack Hanson of Jack's Guide Service. 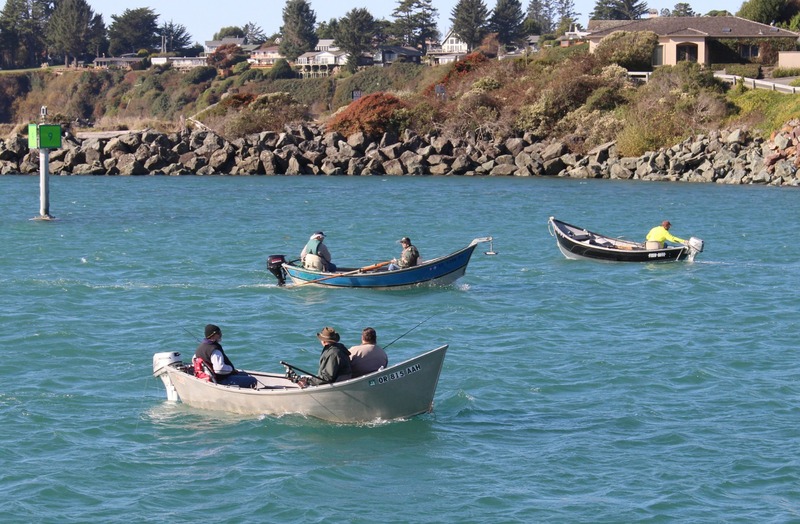 Boats troll the Chetco bay in the hopes of getting one savage take-down from a fresh Chinook.